This one actually throws a pleasant surprise. Typically when it comes to independent films one can't really be sure of the kind of music that they would offer. However in case of Bombairiya there is some effort that has actually been put into creating some pleasant music. Arko is brought on board along with guest composers Amjad-Nadeem and the results are satisfactory. Arko plays the triple role of composer, lyricist and singer for 'Sanki', a Punjabi-Hindi number that is just the kind that on expects from a Punjabi hip-hop album. With a catchy tune to it, 'Sanki' turns out to be instantly catchy and makes one look forward to how it is placed in the film. Producer Michael E Ward chips in too with lyrics for this fun number that has a hook playing right through which makes one nod in appreciation. Next to arrive is 'Bairiya', the word which also forms the base for the film's title Bombairiya. The song arrives in two versions, one which is a Navraj Hans solo and another that has Akriti Kakar joining as well. A sufi outing which has a melodic base to it, 'Bairiya' is composed as well as written quite well by Arko. As a matter of fact one could well have expected a song like to feature in an Akshay Kumar film since the superstar is known for including such music for a soothing love song situation. This one deserves to cover good distance in both the versions. Amjad-Nadeem chip in for 'Sajde Karoon'. They write as well as compose this number which is spearheaded by Yasser Desai with Warsi brothers (Meraj Warsi, Riyaz Warsi, Faraz Warsi) adding on well in the background. A 'qawalli' that manages to establish an identity of its own and adds on to the genre that it belongs to; 'Sajde Karoon' could well be utilized for a devotional as well as romantic outing. This one makes it three out of three for Bombairiya. 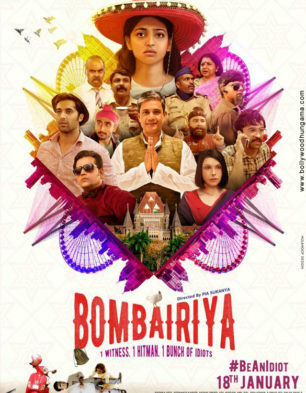 Music of Bombairiya is good and it would have covered some distance had it been promoted well. One just hopes that the soundtrack doesn't go unnoticed due to lack of awareness.